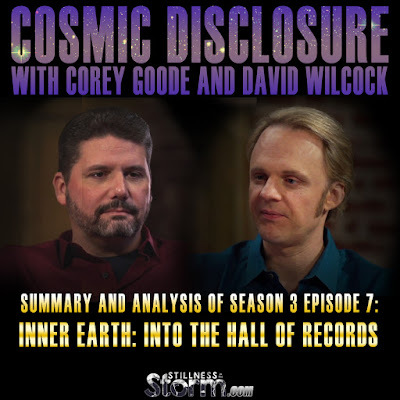 In the fifth and final installment of the Inner-Earth subseries, Corey Goode discusses the Hall of Records, the Guardians, karma and side effects of his experiences there. He has already mentioned in other updates that the Sphere Being Alliance are highly revered by the inner-Earth peoples, who refer to them as the Guardians, an extremely old race that ascended into a higher frequency of existence many millions of years ago. Before doing so, they left vast amounts of their technology on Earth and in the solar system. The secret space program refers to these beings as the ancient builder race, which Goode has spoken of in the past. During the previous episode, Goode and the priestess Kaaree, his hostess for the trip, discussed the work of Zecharia Sitchin, and how she feels it was contrived insofar as it can not be verified by reading the cuneiform tablets he allegedly translated. Goode was taken aback by this revelation and spent several weeks pouring over scholarly websites in an effort to confirm Sitchin's claims. Ultimately no verification could be done, and he concluded that she was telling the truth. During this episode, David and Corey spend some time separating fact from fiction in relation to Sitchin's narrative. Goode also shares that the inner-Earth peoples do not believe in karma, which sparks a conversation into what karma actually is. I offered a detailed account of my own insights into this controversial topic. Goode states that a major shift occurred for the inner-Earth peoples after they learned that the Guardians have returned, who are, again, the Sphere Beings. But they were dismayed by the fact that the Guardians did not acknowledge their appeals for communication, which is most likely one of the reason they reached out to Goode, as he is the Sphere Being Alliance delegate. According to Kaaree, the Guardians lived in the solar system billions of years ago, constructing energy barriers that kept the solar system protected for eons. But at some point in the distant past, a race that evolved in the solar system, via their violent tendencies, brought down the barrier, which allowed all manner of self-serving groups to enter. It was many of the latter-day groups that instituted what Goode has referred to as 22 genetic, social and spiritual experiments on the Earth, which are still active to this day. After this long period of discussion, both Kaaree and Goode descend further into the library, reaching an area where hundreds of people were sitting in silence. Kaaree said that some of them are reaching out with their minds to people on the surface, hoping to make contacts with people who feel 'they are special.' She also said there was another group that was in shared telepathic experience, able to interact via mind space to discuss and work together towards some undisclosed goal. Beyond this point, were the Hall of Records, where Goode and Kaaree entered a huge domed chamber containing a large crystal. Apparently the area was heavily regulated, both in environment and restrictive access to people in their group. Kaaree told Goode that they were accessing information in the crystal and attempting to cause it to grow. Goode later went through a final cleansing ceremony, being teleported to the surface moments after leaving, in the standard time dilation protocol he was used to. He said that this has been a major life changing experience for him, and that since this trip, his intuitive abilities have been greatly enhanced. 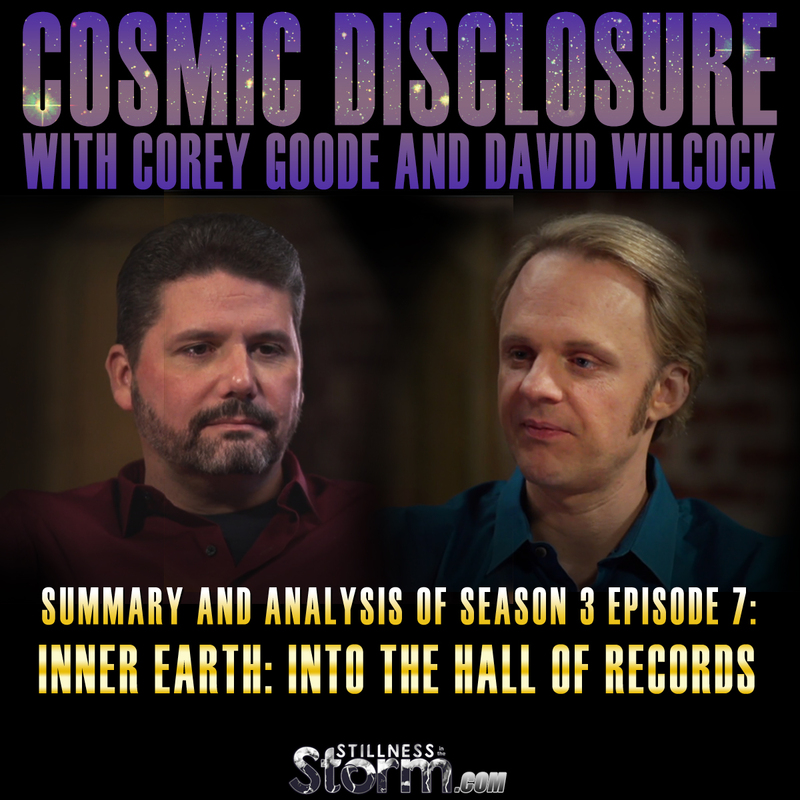 This is part five of a sub-series covering Goode's trip to Inner Earth. For part one, two and three, see the below-linked articles. Deeper into the library Corey Goode comes across the hall of records. It is less about the contents of this room, and more about the activities taking place here. What he learns will send ripples throughout the secret space alliance and may cause you to question information received from telepathic connections allegedly made with extraterrestrials and ascended masters. This interview with David Wilcock was originally webcast February 16, 2016. DW - And what happened? CG - Over three weeks. CG - It was not matching up and it was working out exactly like the scholars were saying on the Internet it would. There was no talk at all <short laugh> of mining gold [in the translations I found]. CG - There was no "they’re" there. DW - Alright. Well, one of the other things Sitchin says — let’s just get our hands dirty here. He surmised that there was a super-Earth that he said the Sumerian tablets called Tiamat that was destroyed and became the asteroid belt. And you did say that this priestess [Kaaree] told you, and others in the Alliance told you, that there were surviving human civilizations from planets that were destroyed in our solar system. CG - Or made uninhabitable. DW - Okay. And you also said in the previous episode that the priestess said that the actual data in the Sumerian cuneiform is remarkably accurate if it’s translated properly. CG - And looked at literally and not looked at and made into what you want it to be. DW - Tiamat: was that a planet that was destroyed and the survivors came here? Is that part correct? [Transcriber, HP's Note: The asteroid belt located between Mars and Jupiter mostly consists of irregular bodies with a wide range of sizes. A notable exception is Ceres, the largest member of the belt. Astronomers reclassified it as a dwarf planet in part because of its spherical shape. Current mainstream astrophysicists have espoused the notion that the asteroid belt was formed by a gradual accretion process from the primordial solar nebula. CG - Well, let me get back to the conversation I had with her. DW - Billions with a B? CG - There was an ancient race called “the Guardians” [who] had long since left “our frequency” <gesturing quotation marks>. And this was according to her — this was the same race that the Secret Space Program (SSP) calls the Ancient Builder race. She said that the Guardian — it’s hard [for me] to call it what they call it — but she said this Guardian race [was] extremely advanced and powerful. [They] protected this region of the galaxy — these local star clusters. And there wasn’t any different ET or other groups that would think of violating their territory, their space. Even after they had left this frequency, they had types of energetic barriers that protected their zone that was theirs. Inadvertently, these groups on these other planets in our solar system… [They] were native to our solar system. They didn’t come from somewhere else. They grew and developed on these planets here [in our solar system]. [These groups that evolved natural in our solar system, some of them] were very aggressive, very technologically advanced. Somehow, their weaponry… they did something very cataclysmic that destroyed, did massive destruction to a planet, and also energetically brought down this massive protective field. And in doing so, it sent out a beacon across the cosmos that, at that time, all of these ET races then started rushing into [the once Guardian protected] space. DW - Now, you had given us an estimate from the smart glass pads before about when the Draco arrived, and I think you said it was 375 thousand years ago, roughly, that they told you? CG - Right. I’ve heard 340 and 370 thousand years [ago]. DW - 370? Okay. So that fits in with the timeline in the Law of One about when this super-Earth was destroyed. [DW also covers the Law of One side of the story in his Wisdom Teaching series]. CG - Right. And also around 500 thousand years ago, there were other groups that came here before the Draco. CG - The Draco weren’t the first. CG - Then these [other] groups came. [They] started coming in [and] her people referred to them as genetic farmer-type groups. They came in and started taking survivors from these other planets and moving them to Earth as refugees. And that’s what started to cause all the massive problems here on our planet and in our solar system. That was the beginning of all of these huge genetic and other experiments that are not just genetic: the spiritual — all kinds of experiments that [these other groups were] doing. DW - Hmm. So mass immigration was able to occur once this protective quarantine went down? DW - And this “Great Experiment” <quote gesture> that they’re doing, that’s where this all started? CG - Right. According to these people. DW - This is connecting a lot of dots. It’s very interesting. CG - It was connecting a lot of dots in the smart glass pads too, but you know, this was coming from people that had admitted to deceiving people on the surface, [telling people] they were ETs and gods. So I was keeping my critical thinking cap on but so much was matching [up], so many dots were coming together, it was just blowing my mind. And she then said that everything changed after the return of the Guardians. DW - <First nodding “Yes” then showing puzzlement> What are we talking about? DW - Well, that’s huge too. DW - Their people? I don’t understand what you’re saying. CG - The Inner Earth people wanted an audience with the Guardians. DW - Okay. They wanted to know why they were being rejected. CG - Well, yeah, or not acknowledged. CG - Not even acknowledged [at all]. DW - And then along comes, in Harry Potter terms, this mudblood mixed guy, and he’s the only one they’re going to talk through. CG - Right. And then I told her that they had said that there are many ET groups here that are positive, but they are still a certain percent service-to-self because they have agendas. And that didn’t set well with her. She said, “Well, wouldn’t that make the Guardians service-to-self?” I [replied,] “What do you mean?” She said, "they are here on an agenda. They are here on their own agenda." DW - In Law of One terms, they have direct access to the Logos like you’re accessing the Internet, and they’re following its will. DW - It says in the Law of One that they cannot go from sixth density to seven density, the group doing the channeling, until every person on Earth has transitioned into fourth density because of the mistakes that they made building the Great Pyramid, thinking it was going to be a tool for ascension, and then having that object and the religions associated with it getting co-opted by the elite and turning into what most people call the Illuminati. CG - So I didn’t know how to respond to her to that. DW - Well next time, bring me down there, bro. <Laughing> If they’ll let you, I’d be happy to explain. CG - We talked about a few other things. I didn’t understand. We talked about the wheel of karma and about how her people have not fully accepted karma. And I thought that that was kind of an oxymoron. DW - They don’t acknowledge that it works? DW - Well, now these people sound more in Law of One terms, more like fourth density than third density. CG - They claim to be fourth density. DW - Okay. So that would mean that, like in Law of One terms, third density’s 100 times more intense karma and suffering than fourth. So you could go a lot longer in fourth density without actually seeing the results of your karma, whereas in our reality, like John Lennon said, “Instant karma's gonna get you.” So they might not be experiencing that. It’s very interesting. [Let me take a moment to discuss some of my own research into karma. The notion of needless suffering to 'pay back' harm we have caused to others is not a valid universal premise. And this false version of karma has been seeded into most major religions as well as many contemporary 'New Age' philosophies. For example, in Christianity, if one sins against god, they must be sent to hell, and suffer for all eternity. Conversely, in some New Age doctrines, 'ignoring the negative' is upheld as one way to avoid negative experiences, or what we could call karma. And there is also a notion that if we think we've done harm to others, we must suffer, which becomes a sort of self for-filling prophecy. But all of these are only pale reflections of true karma. So what is a valid concept of karma? Ra states that their understanding of karma is much like inertia, which is the tendency of things in motion, to stay in motion, until a countering force acts upon it. Ra says "those actions which are put into motion will continue using the ways of balancing." But what is being balanced? The universe is founded on Free Will and Divine Law, which we could also call Natural Law, acting in concert to unfailingly offer wisdom to each being in creation. As individuals we have free will, we can choose our path of progress, and the universe balances our choice depending on Natural Law and our current level of attainment, our current level of received wisdom. For example, if we ignore the reality of gravity, and jump off a cliff saying "I don't believe in gravity!" the universe will balance our choice with law, immutable and unchanging. It does so by showing us the errors of our choices, meaning that what is generated in the objective reality is the wisdom of the universe. In this case, our failure to recognize gravity (lack of wisdom) caused us to make the choice of jumping off a cliff, and the balancing action to teach us wisdom was to let us fall. Now in the experience of falling, which most people label as 'negative,' we are given the opportunity to see the error of our ways, to recognize that we made a choice based on incomplete or false knowledge. Then from a place of greater understanding we can make a new choice, we can change our beliefs to reflect our greater understanding, which is a "controlling or higher principle which [we] may liken unto [our] braking or stopping." So karma is inertia, but not physical inertia. Karma is the mental inertia of our past choices influencing present experience, the movement of consciousness through beliefs and ideas we've chosen to accept as truth. If we believe we can defy gravity, then this belief causes us to take an action which generates karma, an experience that shows us we were wrong in what we thought was truth. But the point isn't to make us suffer, just for suffering sake. The experience can be labeled as suffering if we refuse to seek out the wisdom in it, if we refuse to open our minds and hearts to the truth that we were wrong in our thinking. But the whole point of karma is to help us make contact with and receive The Truth. I discussed this notion of karma in terms of negative and positive knowledge in the below-linked article. So in simple terms, karma is cause and effect or causality; when we act without wisdom the universe manifests a perfect result to show us our lack of understanding, which if we are willing, can be observed, contemplated and understood so as to gain wisdom and grow in spirit. In this way karma is one of the many methods the universe uses to offer spiritual growth to the evolving creatures of time and space, honoring their free will choices without fail. Karma is the universal balancing force for ignorance, which is the choice to stagnate spiritually. When we 'think we have it all figured out' the universe will show us what we don't know, the question is, will we be willing to receive it? We can jump off a cliff trying to ignore gravity as many times as we want, and the universe will give us the same result again, and again, and again, offering us wisdom while it honors our choices. The truth is eternal and absolute, and so is the patience of the universe as it waits for a creature of time to see the light of truth. As one on this score, if Ra and the Sphere Beings are in fact the same group, then their initial effort to assist humanity by building the pyramids created a karmic connection to the people of Earth. Because our world was forever changed after that event, they are now involved in the drama, and the lesson for them, was to learn the ways of spiritual ministry, where free will is honored while at the same time steps are taken to offer wisdom, sound familiar? The group known as Ra has changed their policy with respect to evolving races since their involvement in the creation of the pyramids. They no longer make physical contact with peoples of the Earth and only do so using 'the ways of mystery' such as through channeling. They also seem to have refused to work with any group that does not have noble intentions. While the SSP Alliance is hardly a benevolent group, it was their intention to finally reveal the whole truth to humanity and end slavery that the Sphere Being Alliance took notice of and began contacting the SSP Alliance. Assuming that their intention was actually complete and in harmony with Natural Law, this would have qualified the SSP Alliance enough to indicate to the Sphere Beings that they are capable of honoring the will of the cosmos, or following the Law of One, to use that vernacular. Yet even in this instance, the Sphere Beings waited for a delegate of the proper moral foundation to begin closer dealings. Presumably, that person is Corey Goode. So while karma has been greatly misunderstood on our world, it is simply the cause and effect relationship created by beings of spirit endowed with free will who act with incomplete knowledge in a universe of immutable and eternal laws. And since every being in creation is a finite distortion or embodiment of the creator, not all knowing, the risk of error and mistake is always present. Karma, in this sense, is the synthesis of relative free will and Natural Law; the merciful actions of a loving creator that honors free will so absolutely it will allow it's spiritual children eons of time to realize the truth. As a final note in this interlude, the inner-Earth peoples seem to have been experiencing karma as well, although over much longer spans of time than the surface population. 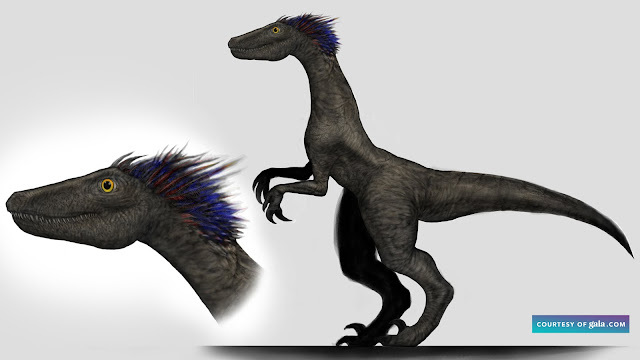 They claim to have existed for 20 million years below the surface, yet have progressed spiritually very little in that time; having to defend themselves from aggressive groups as well as losing access to sacred sites, and they were unable to make contact with their beloved Guardians, despite their claims to be highly evolved. While I am hardly qualified to pass judgment on them, I do recognize that their policy of deception and xenophobia seems to have caused them stagnation their spiritual grow. The surface people are the ones that they are ostensibly supposed to be ministering to, due to their highly evolved spiritual status, yet because of their policy, these same 'barbaric' surface people are now a clear and present danger to them, a karmic situation if there ever was one. According to the Law of One, fourth density is an approximately 30 million year cycle, wherein beings could be harvested to fifth density if they are ready. Considering that some of these inner-Earth groups claim to have existed for 20 million years, then the question is have they made any progress towards fifth density? Again, I am hardly qualified to cast judgement, but given the lack of interaction these groups have had with the Guardians, and that the Sphere Beings told them they have “not been proper stewards” of the planet, it stands to reason that these inner-Earth groups, who are not acknowledging karma, according to CG, have a lot to learn before they graduate. I suspect that this time in history, where all these things are coming to the surface, a moment of great change, that the Sphere Beings, the inner-Earth peoples and the surface population are being provided a karmic opportunity by the universe to learn and grow. But we actually have to choose this path via seeking knowledge and being brave enough to question our past choices so as to make better ones in the future. CG - Yeah. So pretty much, we had gotten to the end of our conversation. We got up and we were leaving. And she said she wanted to show me the next two floors of this library area. And we walked downstairs for this. The next floor was this huge area of those egg-shaped chairs, and there were a lot of people sitting in them. Some people reclined, some people sitting in circles. CG - Ah, a lot! DW - Yeah, many hundreds. CG - Yeah. There were a lot. DW - Was it noisy? Were people talking? CG - No. It was completely silent. CG - And we walked right from one end of the room, right down the middle, to the other end of the room. DW - Was it all open, or were people in little rooms? CG - It was all open. CG - And she was telling me… We were communicating telepathically. We were interfaced. We were not verbally talking. She was telling me that all of these people are sitting and waiting to receive communications from humans on the surface that are reaching out with their mind[s]. Or they are reaching out to people or are having an active communication with people on the surface. DW - So you’re talking about channeling. CG - Telepathic communication. And then there was another area … where there were people sitting around. She said that they were having a shared experience … where they were viewing information from either the library’s Hall of Records and having kind of a telepathic tele-conference together, viewing information and discussing it while in a reclined state. DW - Something that we rushed through before on this show, but people who read your report of Part 1 would have remembered seeing is that when Gonzales gave his little speech to the Inner Earth Alliance, and then they came up and all started taking shots at him. One of the things you said they said was that they were going to deliberately disinform the contacts they were in touch with on the surface telepathically because of you guys learning this information and them being forced to give it to by these Guardians that have showed up. DW - So it’s like operational security: same thing that the Cabal does with seeding disinformation to try to protect their secrets. DW - Wow. Now, anybody who’s been following you online knows that it seems like every weekend you and I are exchanging e-mails about this all the time. We’re definitely not going to name names, but there’s a flavor of the week channeler who keeps popping up trying to co-opt all the stuff you’ve been telling me on the show. But then they wildly change it all around and rearrange everything. [They] try to blend it into their story. It seems every week somebody’s doing this. So are they telling you that these people, or at least some of them, are actually being influenced by them to make up these stories? To try to cloud the truth with disinformation? CG - Yeah. I’m not saying that all channeling is corrupt by any means, but the vast majority is interference and people feeling that they’re special, overconfident in their spiritual strength and abilities that are connecting with these subterranean beings. DW - So what are these groups telling people? If they’re talking to people on the surface, they’re not necessarily giving truthful information. CG - Well, they’re approaching them as ascended masters, ETs from different star systems, sometimes as religious icons from the people’s belief systems, and passing on positive information. They’re not giving them negative information that’s trying to hurt them. They’re trying to help people overcome what they see as our negative genetic and environmental programming to become better and to help start changing society from afar, remotely. Remotely influencing. DW - Do they have the ability to create, for some folks, like a holographic apport, or image of their form or the form they choose to project? CG - Oh, they can create all that in your mind. CG - Right. And a lot of times, it’s a shared thing … where people are contributing to the experience. The people are contributing a star system that they’re communicating with. They’re contributing a religious icon that they’re talking to. It’s bi-directional communication. So the people on the surface that they’re talking to are also contributing to this shared illusion. DW - So these folks feel like they’re seeding a more spiritual perspective into humanity? DW - And that the good outweighs the bad in terms of the ultimate goal of what this is all about: to reduce our aggressiveness, to sort of vibe up the planet. CG - Yeah. And to protect operational security, to protect their cultures, and keep us from coming after them. CG - Now, so basically, that’s pretty much all to report other than the last floor, the Hall of Records. And this is going to tie in something very important. DW - Great. Let’s get right into it. CG - When we went down to the bottom floor, we couldn’t go in. It was very bright. DW - What do you mean you couldn’t go in? Was there a barrier? CG - We couldn’t go in. It was a complete, like dome all the way down to the bottom. Nothing flat. It was a complete dome, and you could see in through like a window but there was no glass. There was some sort of field there. DW - So the floor of the dome was below where you were standing? CG - No. We walked up to the dome on the bottom floor. CG - But we couldn’t go inside because it was extremely hot, and almost like a clean room. They had it totally regulated. People couldn’t go in and out. And inside the room was a single crystal just like the crystal from the crystal cavern. DW - That you talked to when you were 11 years old? 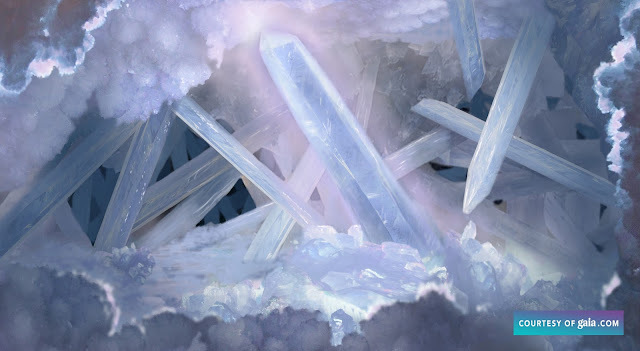 Artist depiction of the crystal cave visited by Corey as a child. CG - They had it in a state of trying to get it to grow. CG - And the information that was in that crystal, people were telepathically connecting to it in the floor above as well. DW - Isn’t that something. What was she saying they were getting out of it? Did she tell you what was the information inside the crystal? CG - No. She showed it to me [and] told me that it was in the process of growing in the chamber. They were drawing information from it. And now I see why my experience was so important to them, to share. And that experience is going to be shared with all of the people. DW - It’s also very interesting, just that the raptor is — it’s like the archetype of the dragon guarding the virgin and the treasure. DW - The raptor, these nasty, bird-like reptilians are like the dragon, and the treasure is like the crystal, and you happen to get in and see the treasure. You said that they told you this is like the only thing that we mixed bloods have to offer them: your experience interfacing with this crystal that they can’t get to because these dragon-like raptors are guarding it. CG - And Gonzales told me that that wasn’t true, that they needed us or they wouldn’t have approached us. DW - Well, if they can’t talk to the Guardians themselves, then obviously, they need help. CG - So after this, it’s fairly easy to wrap up. She said that the others were returning from their realms, that we needed to return for the cleansing ceremony again. This one was much more embarrassing. DW - Much more embarrassing? <Short laugh>. CG - Much more embarrassing. Each person — there were people standing in the water this time and cleansing you. CG - You’d stepped up into the water, and they cleansed you. DW - Except with no clothes! CG - Yeah… I stepped — I disrobed, stepped up, was cleansed, and stepped down, dried off, [and] put on my original clothes. DW - Was it all done in a very ritual, ceremonial [way]? DW - Okay, I figured. 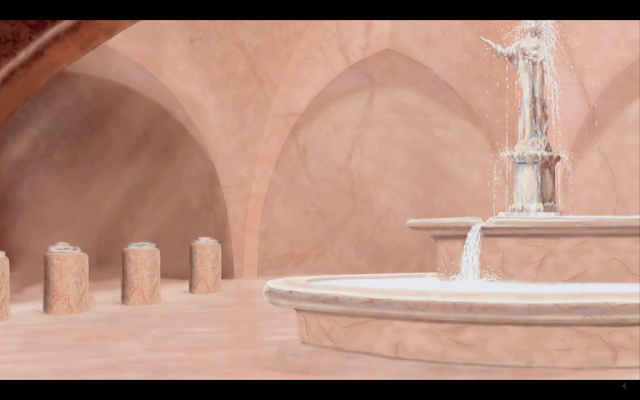 CG - I put my clothes back on and walked back out [to] the room where the priestess was. Artist depiction of the priestess Kaaree. CG - She walked me to about 20, 30 feet away from the center of the room. We said our goodbyes, and I walked to the center: flash and I’m back in the living room. CG - And there was a time dilation effect involved there in that situation as well. DW - So you left and come back pretty much spliced in side by side. CG - Right. And I was gone a long time. DW - Where do you think this is heading? Have you had any further contact, telepathically or otherwise, with this priestess or with these Inner Earth people since this first meeting? CG - I’ve been spending so much time up in my head with this information. A lot of this stuff, I was looking up on the Internet <mimicking typing on a keyboard> trying to verify, especially a lot of this ancient Sumerian Zecharia Sitchin stuff. Very little of this stuff that’s on the Internet that you can verify but I wanted to verify what I could. And the rest, I’ve just been — I sit around and I’ve just been blown away, and thinking and thinking about it. And it’s changed me. It’s been a very life-altering experience. DW - You also reported off-camera — maybe on camera, I don’t remember — that you’ve had a lot more intuitive things happening since this occurred? DW - Phew. Well, this has been quite something. DW - We have a lot more coming up here. I’ve actually gone through and looked at all the things that he and I have talked about, and there’s a lot more content still to come here on Cosmic Disclosure. I’m your host, David Wilcock, and I thank you for watching. 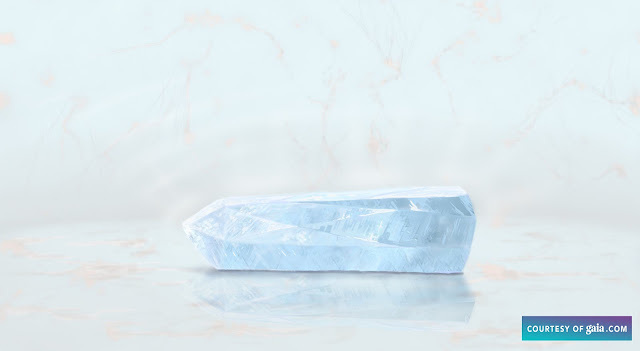 [Transcriber, HP's Note: I found it very significant that I only experienced the precognitive download of information in this part of the episode related to the crystal. Some of it was related to Corey himself. I also got out of these precognitions that what Corey has been experiencing himself was just the beginning and it wasn’t going to “wear off” over time as he speculated it might. It was indicated to me that he would soon see lost memories come back to him and have further abilities being restored. Click here for a Summary and Analysis of Season 3 Episode 8.